To admit my biases up front, The Shadow of the Scourge is a personal favourite. It’s the first of the Big Finishes to show the offbeat humour that will later find full expression in episodes such as The One Doctor, The Kingmaker, and The Doomwood Curse. It also serves as an introduction to Benny – spinoff character archaeologist Bernice Summerfield – who at this point had already had her own Big Finish audio line, which started with the very silly Cornell story Oh No It Isn’t! based on his Benny book of the same name. Here, in Benny’s first crossover with the main line, she is voiced as usual by the sardonic and witty Lisa Bowerman (last seen under layers of fake fur in Survival). “Ground floor: horror, tragedy, and mysterious death,” the Doctor intones, ushering Ace and Benny out of the elevator into the lobby of the Pinehill Crest hotel. Pinehill is hosting three simultaneous conventions: spiritualists channeling Om, physicists at the unveiling of a temporal accelerator, and cross-stitchers. It’s also host to a dead body in the next lift. That is enough to kickstart a murder investigation, but each of the conventions is also, according to the Doctor, in need of oversight. With Ace dispatched to monitor the physicists and Benny to the spiritualists (“Why do I get all the loonies?”), the Doctor claims he is free to indulge his penchant for needle arts. Benny expected a set of loonies; what she gets is to be witness to the beginning of the invasion of Om the Scourge, who is not the peaceful entity the spiritualists assumed. (Their meditations had left out the “scourge” part.) But why, instead of launching to the defense of Earth, does the Doctor greet the aliens with a detailed contract specifying terms for his help in launching a successful takeover? There are occasional moments of over-acting, and the resolution gets surprisingly touchy-feely. Still, Shadow of the Scourge is a delightful audio for everyone who likes their stories a little bit on the snarky side, and an absolute must for Benny fans or anyone who’d like to meet her. In the liner notes, Cornell thanks “the attendees at Panopticon 2000”. I’m just terrified to imagine what happened at that convention to inspire this audio! 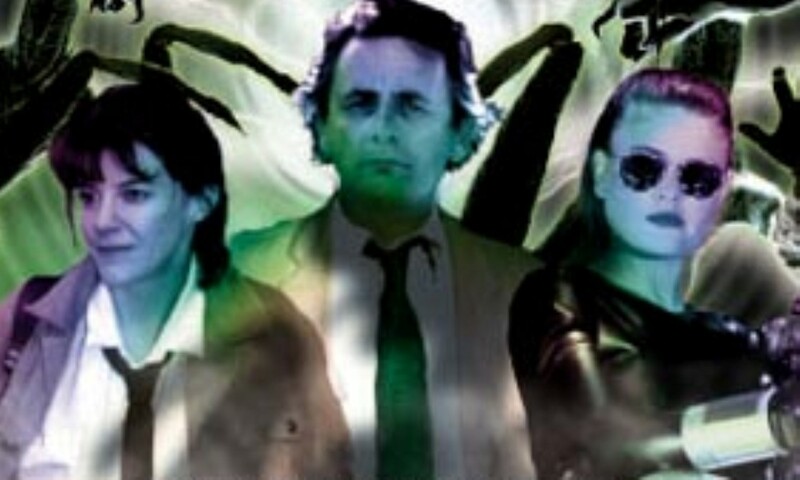 The Shadow of the Scourge (by Paul Cornell; starring Sylvester McCoy, Sophie Aldred, Lisa Bowerman) was released by Big Finish Productions in October 2000.